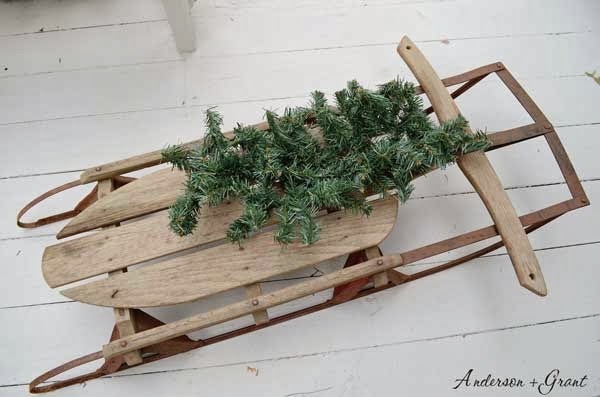 Fast forward many months and I was lucky enough to find another vintage sled at a decent price. I thought it would be perfect to buy the sled and do the same thing with it for all of you to see here. I still had plenty of the ribbon so all I needed was the swag of beautiful greenery from Hobby Lobby. The problem is that the closest Hobby Lobby is about two hours away. 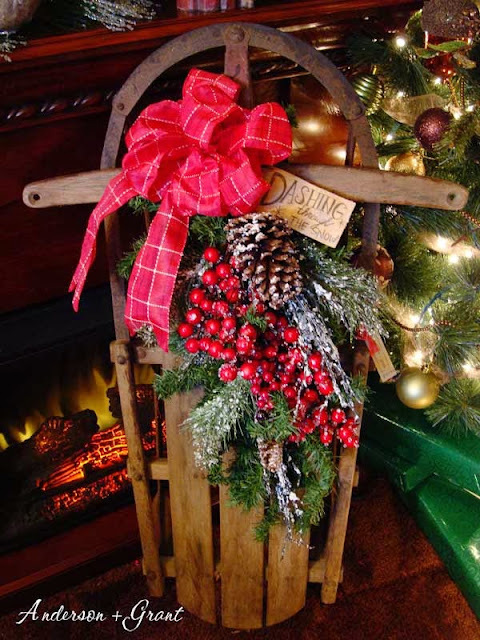 But I was patient knowing that when I could go, the same greenery would be waiting for me......I know you are on the edge of your seats with this story.....This year, Hobby Lobby did not have anything close to what I bought last year until AFTER my open house. 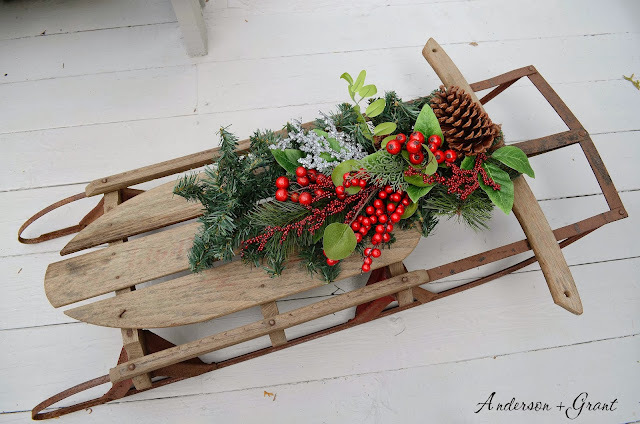 So today this tutorial is not only about how to put together this amazing sled, but also what to do when what you want isn't available (which happens to me more often than not.) You have to compromise.....think outside the box....make it yourself. 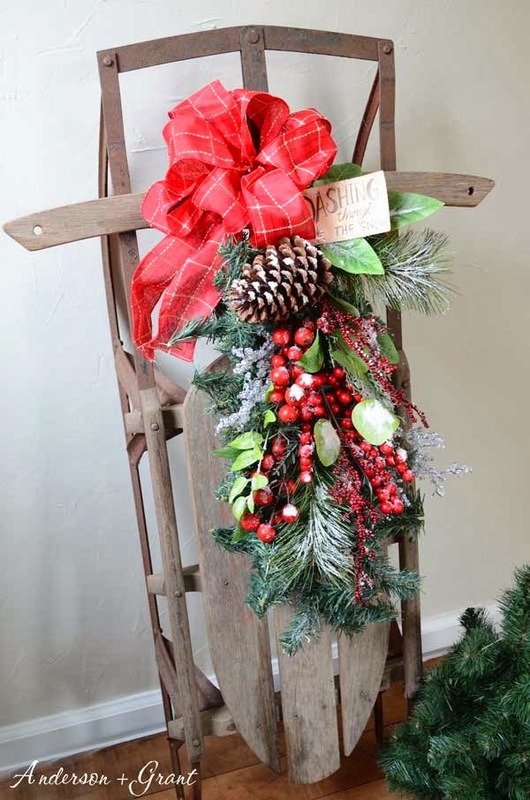 Greenery that has berries and pinecones OR Fancy greenery AND berries AND pinecones. 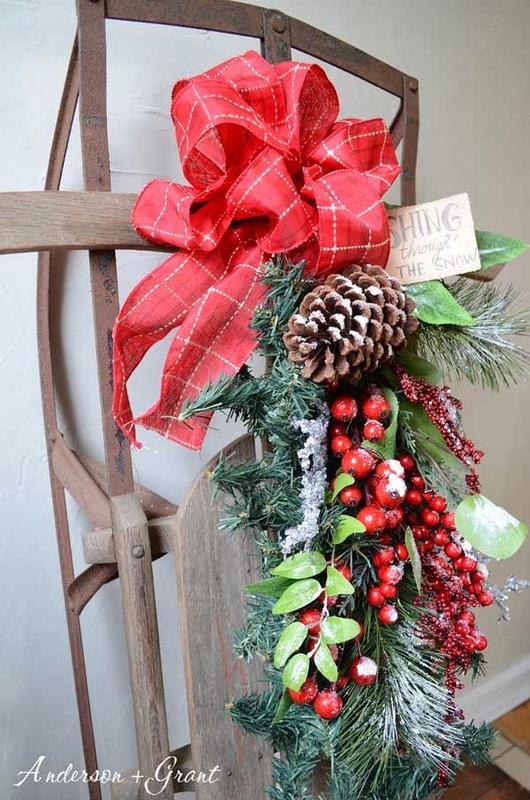 While I wasn't able to get the same swag of greenery, I was able to get a small wreath (at a much higher cost, of course) that had berries and pinecones in it. I cut the wreath into two equal pieces and used just one. 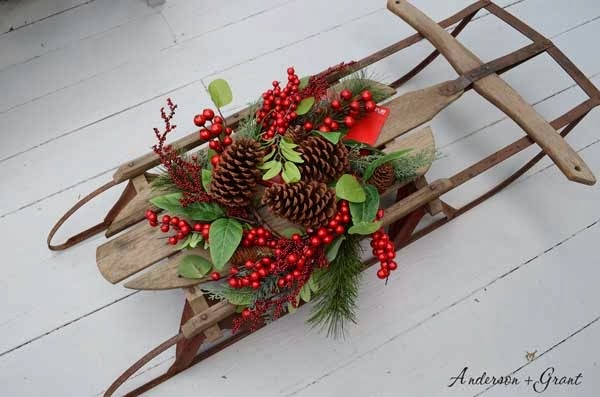 The fancy greenery isn't really full enough to cover the front of the sled, so you'll need to use the cheap greenery behind it just to fill everything in. You won't see much of this by the time the piece is done, but it does make a difference. 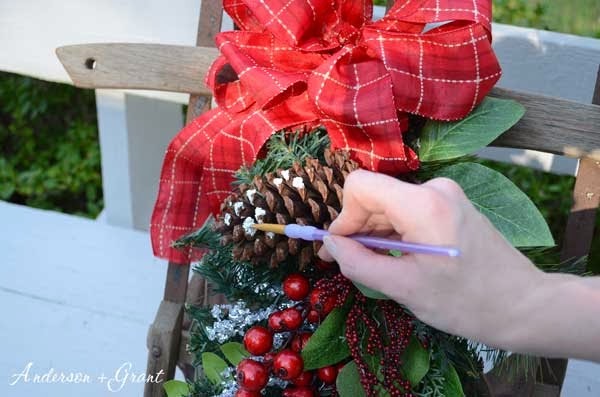 Attach a section about 1 1/2 feet long of the cheap greenery to the fancy greenery with the floral wire. Then wire the entire piece onto the sled. Create your bow.....I am not the world's best person at explaining how to do this, but here it goes.....What I do is figure out how large I want my bow to be, take that length of ribbon and then fold the ribbon back over that section for the same length....do this for as many loops as you want your ribbon to have (folding it over four times will give you eight loops when it's done) holding the ribbon in the center of all of the loops. 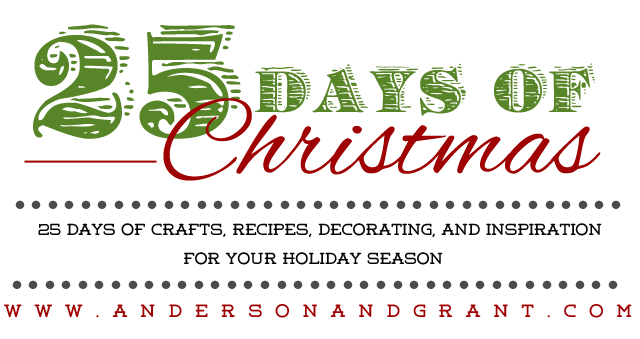 Make sure that you leave a section at each end of ribbon to hang down after your bow is tied. Wrap the center with wire and then fluff out all the loops of the bow. If I've totally confused you, google how to make a bow and maybe someone else can explain it better! 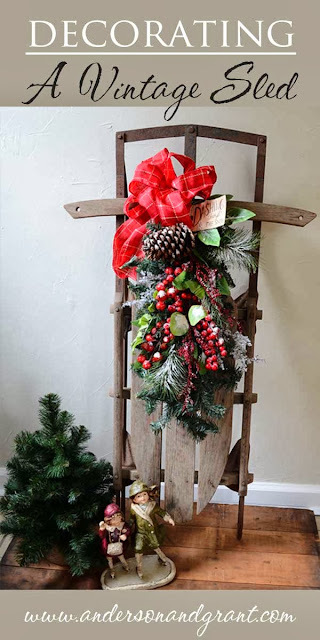 Attach the bow onto the sled with some more floral wire. I made my own tag using an Avery Shipping Tags . 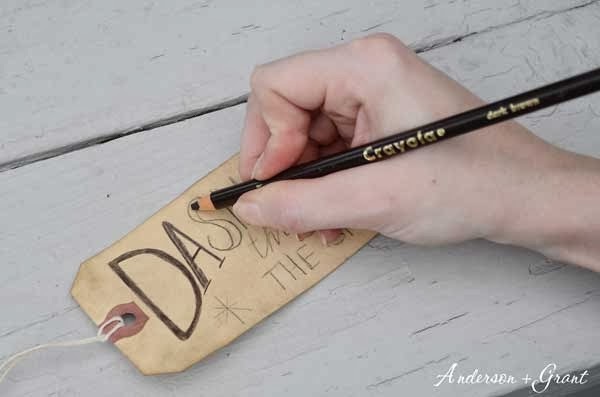 I dyed it with some walnut ink and then wrote "Dashing Through the Snow" using a dark brown colored pencil. I dusted it with a little glass glitter (and Mod Podge) in places. Tie it onto the greenery somewhere around the bow after it dries. 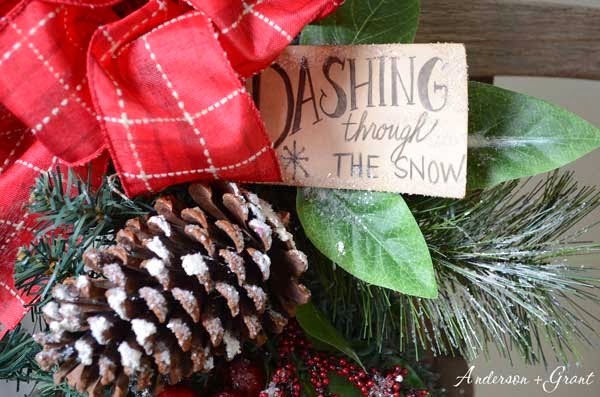 To make your greenery look snowy, add some snow from the craft store. You'll find it in the paint section. Using a brush that can be thrown away, dab the snow on the greenery in random places....however the snow would really fall on a sled. When that dries, add a little Mod Podge in places you'd like to sparkle, and then shake on some glass glitter. Be sure to put some newspaper underneath the sled when you're doing this because you'll get glitter all over. And that's it....It is a really simple process if you are happy with the greenery available in the store, but there are ways that you can tweak the greenery if you're not happy. I have to say, now that both are done, I think I actually prefer the second version....I like all the additional berries and different leaves. What about you?